Ingham chicken breast nuggets are a delicious snack that is easy and quick to make,they are lovely with dipping sauce and sour cream or great by themselves. Chicken Breast Nuggets are a worry for me, ever since I saw the Jamie Oliver thing on them. These gluten free ones are a bit tough. Sorry, not a great fan of this one. These are great for the kids, real chicken in each nugget. Fantastic for a lazy dinner, finger food at a party or in the school lunchbox. Add some chips and/or salad and you have a complete meal. 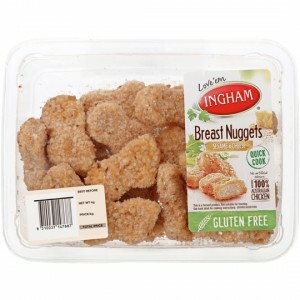 How would you rate Ingham Chicken Breast Nuggets Gluten Free?